I just sent a board to SA with e-go. It was the cheapest quote I could find. 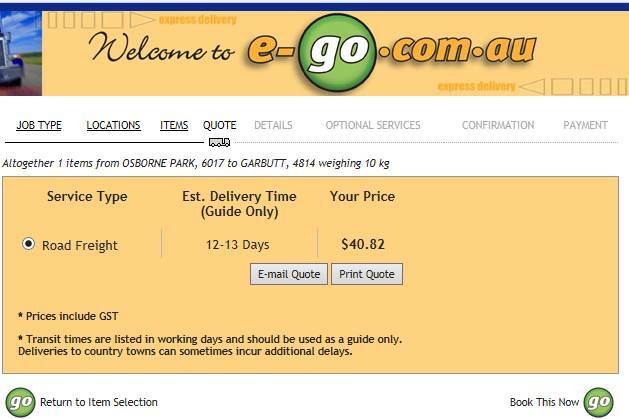 Other couriers were 5 to 10 times more expensive. I found them hard to deal with. It took almost 2 weeks for the board to be picked up from home but delivered to Adelaide in 5 days. There's another thread on seabreeze about couriers as well. I always use E-go. Never had a problem. Just had a mast sent from Perth. Only cost $9 . Book on line and use Depot to Depot. 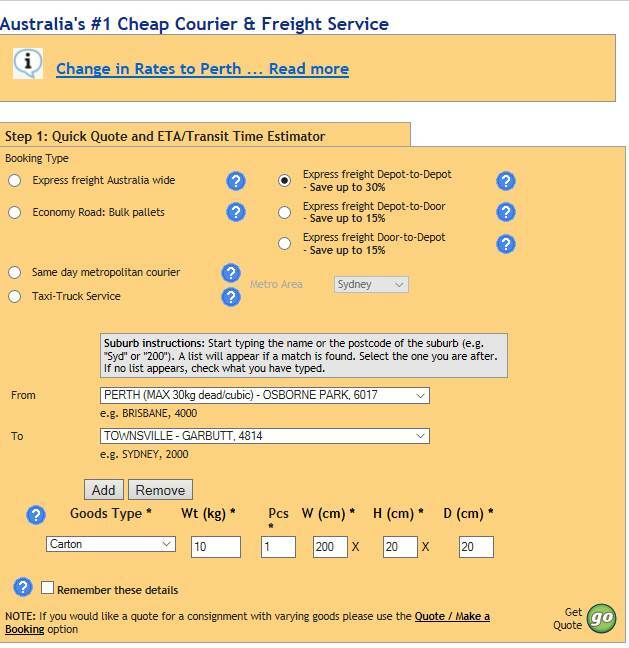 A carton 200 x 20 x 20 cm Perth to Townsville will cost you $41. Dunno how you folks are getting these prices - a board was about $120 east west and a sail about $80. A few months ago that went up to about $300 and $160 respectively. I have had quotes from SmartSend and E-go of $150 for a surfboard. Jacko you must have an account...? No account. Book online not over the phone. Ah! Thanks Guys . Need to check e go for next time. Wrap the sails up together (remove from the bags) by rolling together as one with the bags in the middle and then wrap with bubble wrap (tightly and tape) and cardboard at each end that way you reduce volume and will save heaps. You should be able to get it down to $10 -$15 with two sails wrapped this way. You need to forget the box as it takes up volume and "shipping air" costs more. Dimensions of 200 x 10 x 10 should be possible, particularly with wavesails.